Major League Baseball’s opening day is on Monday and that means it’s time to call in sick, head to the stadium and go eat until you actually are sick. Even as Major League parks go to great lengths to offer some decidedly upscale food—the Seattle Mariners, for example, are featuring a menu from local James Beard Award nominee Ethan Stowell for the second year—the arms race for the biggest, craziest and most fried food in baseball continues. If you are headed to the ballpark on Monday here are eight things you can get that will have you knocked out by the 7th inning stretch. What’s the biggest problem with baseball stadium nachos? They’re too messy. All that “cheese” just gets everywhere on a hot day. So the Brewers have made them easier to handle. They took beef, topped it with refried beans, rolled it in Doritos, put it on a stick and deep-fried it. Topped with a little sour cream and cheese and you’ve got nachos on the go. 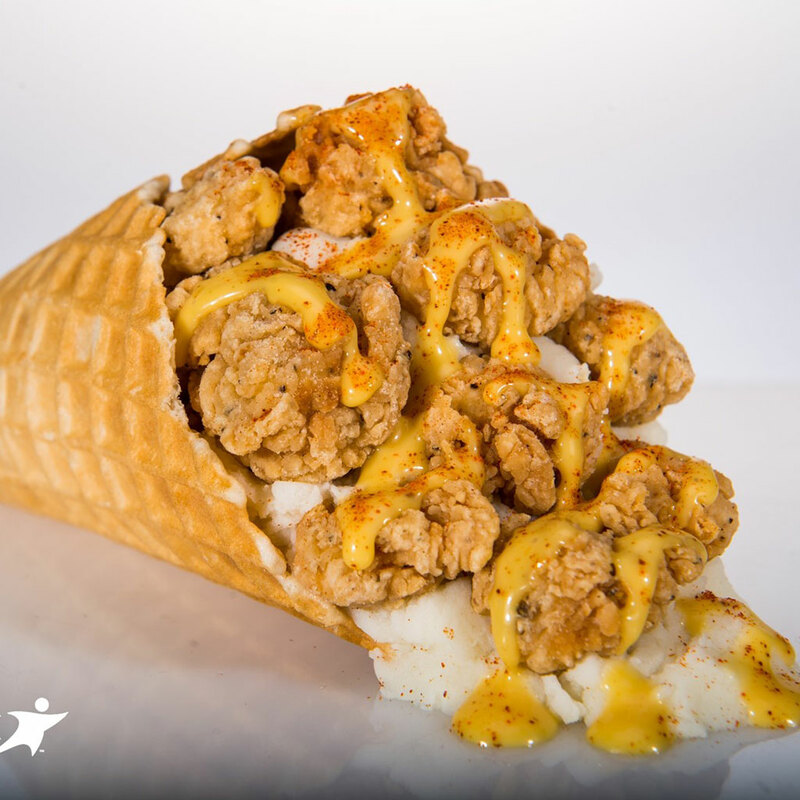 Take a fried chicken dinner, roll it up in a waffle cone and you’ve got this bit of insanity at Houston’s Minute Maid Field. Inside the cone: An order of fried chicken tenders, a lot of mashed potatoes and a drizzle of honey mustard. This 2,200-calorie, 9-patty cheeseburger from the up-and-coming Wayback Burgers chain will be hard to finish. Maybe fans will throw the leftovers on the field. They will hurt less than D batteries. Anything that can be fried but does not need to be fried is getting fried in Arlington, Texas this year. That includes, for some reason, entire ears of corn on the cob. Bacon probably peaked a couple years ago, but s’mores, like the Mets, are on the upswing. So Citi Field’s executive chef (yes, baseball stadiums have executive chefs) decided to dip his bacon on a stick in chocolate and top it with graham crackers and marshmallows. Thankfully there is no actual hot dog involved in the making of the churro dog in Phoenix. There is however, 1100 calories of fried dessert. The Diamondbacks place a whole churro inside a split, chocolate-glazed doughnut and then top it with frozen yogurt. They went with fro-yo instead of ice cream presumably to make it a little healthier. They aren’t monsters you know. The Brewers made it on the list once already with nachos on a stick, but we had to give them another nod for the pulled pork parfait. Don’t be fooled, they haven’t mixed ice cream and barbecue, those are layers of mashed potatoes in the cup. The twins rolled out a whole menu of insanity when they hosted last season’s All Star Game, but we actually like the new direction they’re taking this year with beer milkshakes. Beer and ice cream actually can go well together and a wheat beer creamsicle shake actually sounds just crazy enough to work.